January 30, 2011 Filed in Jazz, Photography, Singers, This is My Oakland! 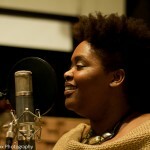 My friend, singer Valerie Troutt at her recent recording session at Studio 1510 in West Oakland. It was a very fun experience. Learn more about Valerie and her music, www.valerietroutt.com.